Whenever the topic of life insurance comes around, it’s not all that uncommon for most folks to want to avoid the topic and simply put it off for another day. After all, who really wants to talk about dying or losing a loved one? But the fact is, death is something that is going to happen to all of us and avoiding “the talk” isn’t going to make the “bills” and “costs” surrounding death go away. Is often even more pronounced when we start talking about the death of a parent! However, we all now know that life insurance is something that is necessary for every individual who has someone reliant upon them or those who want to provide money for loved ones to pay certain bills, mortgage, medical costs, funeral expenses and burial costs, etc. With this in mind, burial and final expense life insurance for seniors can be incredibly useful if your parents have any type of outstanding debt. When they pass away, the policy will ensure that there is enough money to cover these debts so you and other siblings don’t have to find the money and cause your own financial problems. Since ignoring the fact that we’ll all one day face the inevitable, isn’t going to make the financial burdens associated with dying go away, we here at TermLife2Go chose to write this article so that we can openly discuss the questions that many folks have (but may not want to discuss), and hopefully answer many of the questions that could keep many families from being able to seek out the life insurance coverage that they need. So without further ado, let’s get to it! To start, let’s address the most common questions that come with buying life insurance for parents including ‘is the process actually possible?’ and ‘what about life insurance for parents over 60?’. In years gone by, the process of setting up life insurance was a little tricky but it has since been streamlined. Nowadays, getting life insurance on dad or life insurance on mom is easier. Most importantly, you will need to show the insurance company what is commonly known as ‘insurable interest’. Insurable Interest – Although this sounds difficult, it is actually very simple in that you need to provide proof that, if your parents or a particular parent were to die, you will suffer financial loss. In the vast majority of cases, adult children have no problem proving this and they can then be placed as the life insurance beneficiary. As soon as insurable interest has been established, the next steps can be taken and this includes coverage, types of coverage, duration, and various other factors we will assess in this article soon enough. Ultimately, this proof is required by the life insurance company to ensure that you aren’t taking advantage of your parents. If your parents had enough savings to cover all debts, mortgages, and funeral costs, life insurance wouldn’t be necessary because you wouldn’t suffer any loss yourself. If they had no savings and you would be left with the bill at the end of it all, this is where life insurance is required and the proof can be shown. How Much Life Insurance Coverage Amount Should I Choose? Whether you are looking into life insurance for elderly parents or perhaps you are just being cautious while they are still relatively young, you need to know what coverage amount to choose. In truth, we cannot provide you with a magic figure that will work for you and everyone you know because it is very much a unique decision. However, we can provide some tips and it starts with knowing for what purpose the policy will be used. For example, a relatively small policy of $10,000-$15,000 might be perfect if you are only looking to cover the funeral expenses. If there are no debts and no mortgage to worry about, there is no need for a huge death benefit because this only means that they will pay higher premiums for no reason. However, a much larger policy will be necessary if you need to pay for various expenses including debts, mortgage, etc. If you are expecting heavy medical bills, this is also something to consider; even estate taxes should be mentioned in your considerations. As soon as you take the first step of addressing your needs, you will be in a much better position for choosing the right policy because you aren’t just guessing. If you aren’t aware of the average final expenses, funerals now average at around $10,000 and a finance professional can always come in handy if you’re having some trouble with this decision because they will have dealt with clients like yourself many times before. Furthermore, they will know the market inside-out and where to find the best deals according to your situation. Types of Life Insurance Policies for Parents. Alongside the face amount of your policy, choosing a specific type is an important decision. Considering you will have an opportunity to buy term life, whole life, and various types within these two categories, you should spend some time researching the benefits and drawbacks of each. Term Life Insurance – If you were unaware, term life insurance is a policy that lasts for a set amount of time with the most common choices being 10, 15, 20, and 30 years. With no cash value component to the insurance, the policy will be cheaper but you also have the possibility of outliving the policy. If this happens, your parents may be left vulnerable and you will have to reapply to a policy that will be more expensive. However, there is one huge benefit to this option in that it is perfect for covering a mortgage or expenses that might not exist in a short period of time. For example, your parents might have a mortgage with eight years left until it is all paid up. With a ten-year term life policy, you will receive the death benefit if they were to pass away and this would allow you to pay the mortgage. If both are healthy at the end of the policy, it wasn’t used but insurance isn’t required anymore because the main concern has been paid. Whole Life Insurance – On the other hand, whole life is permanent life insurance that normally lasts until death which is the best option for when there are permanent debts that will not be removed as well as covering the final expenses. Although the premiums will be a little bit more expensive, it offers the security and peace of mind because it has no end date and therefore no need to renew in the future. Just as we said with the amount of coverage you choose, there is no right or wrong answer because it all depends on the age of your parents, the health of your parents, and how much debt they have now compared to what the financial picture might look like in ten years’ time. As long as you pay attention to these various factors, you can find a policy that fits around your needs rather than trying to change your needs for a specific policy. Guaranteed and Simplified Issue – Before we go into the estimated costs as well as whether the whole process is worth it, we should also note that you are likely to come across the terms simplified issue and guaranteed issue life insurance. Especially when concerning life insurance for elderly parents, this is important because it will affect the amount your parents pay as well as whether there will be a ‘graded benefit’. Guaranteed Issue – With guaranteed issue life insurance the policy will be granted regardless of whether your parents have been rejected from a life insurance company in the past. Because there is no medical examination nor any health questions, the company is allowing your parents to have insurance but the premiums will be much higher as they are taking a risk. When you see low premiums, this is because the company is obtaining as much information about the applicant’s health as possible; this comes from an exam and various questions. With most guaranteed issue life insurance policies, you are likely to see a graded benefit as a result. Essentially, this is a clause that says that the death benefit will become available over time. Since the company has no information regarding your parents’ health, they will not pay out 100% of the death benefit for the first two or three years. Instead, they will pay the premiums plus a certain percentage. Once the set time period has passed, the full death benefit then becomes available. Simplified Issue – With simplified issue life insurance there is still no medical examination but your parents will have to answer a few health questions. Here, the premiums will be a little lower because the insurance company is getting more information about your parents’ health and their investment is more secure. So we have seen the different types of life insurance policies for parents in addition to providing you with tips for coverage amount and the types of issue. Now, we should look deeper at what you can expect to pay. Please check out our life insurance quotes page for more. As you can see, it is much better and cheaper to buy the insurance at a younger age for your parents. From 65 to 75, the price more than doubles and the premiums on life insurance for parents over 75 years of age can be a significant amount of money. 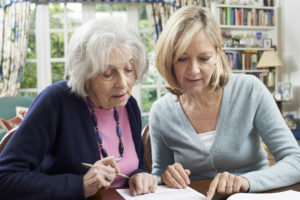 Is Life Insurance for Elderly Parents Worth it? With all of this information in mind, there is only one question left to answer – is it worth it? First and foremost, you will need to assess your needs and gather some quotes. If you don’t know how much the insurance will cost, there is no way you can give an accurate judgement as to whether the investment is worth it. Once you have some quotes, you can start to think more carefully. On the whole, we suggest that elderly life insurance is entirely affordable up until the age of 80. As long as you find the right policy that allows you to keep the costs down, it shouldn’t be a problem up until this age. Of course, it is cheaper for those in their 60s and even early 70s so getting a policy in place early is important and this could be something to remember for yourself. How about over the age of 80? Here, it becomes a little more difficult. If we take an 83 year old mother as an example, $250,000 insurance will cost well over $14,500 per year. Although slightly morbid, let’s say that she has a life expectancy of 10 years; this means you will pay over $145,000 in this time. As an investment, this is a good return if she were to die at any time during the policy. Life Insurance if Over 85 – However, the situation changes again when your parents reach 85 years because the money paid in gets closer to the amount returned after death. In all, we would advise careful planning depending on your parents’ health, debt, and overall needs. If you can do this, you will make the right decision for both you and your parents! Previous Post: Purchasing Life Insurance After Being Diagnosed with Biliary Cirrhosis…. Is it Possible? Next Post: Life Insurance Approvals for Those Diagnosed with an Eating Disorder.